On a brisk, sunny Sunday, Mark and I left our cozy little maisonette in the Garden District of New Orleans and headed into the French Quarter on the St. Charles Streetcar. We had a few destinations in mind - Frenchmen Street, the French Market, Café du Monde, the Faulkner House Book Shop... and then just walking up and down Royal Street listening to the small but infinitely varied jazz combos playing in the street. I had it in my mind to find the place to get a muffaletta sandwich, a New Orleans tradition. I heard that the place to go was at the French Market so we wandered in... There were so many food places that it was overwhelming. I didn't see any muffaletta stands, either. 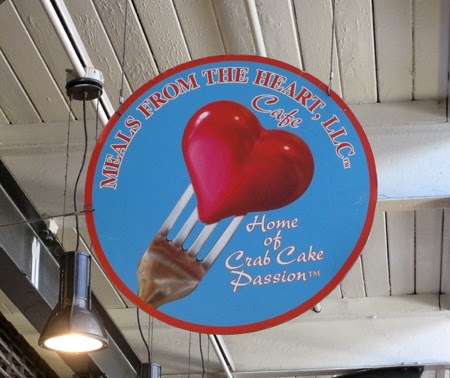 But, as we stood there, we realized we were in front of a really nice looking place called Meals From the Heart Café. (The perfect Valentine's weekend post, eh?) The food looked good; it smelled good; the staff appeared warm and friendly. We bellied up to the counter and placed our order. Now, this could have been like any number of eateries in NOLA. But it wasn't. There was something distinctly different about the food coming out of the kitchen. It took us a while to figure it out. Aha! ... there was a salad on our plates! In the four days we had been in the city, we hadn't see a lot of vegetables anywhere, and certainly not a green salad! We struck up a great conversation with the owner - Ms. Averill Doucette Lazard. She confirmed what we had been thinking... People in New Orleans don't eat a lot of salad. And hers was good, too - really fresh greens and ripe red tomatoes. I love my cast iron Arizona skillet! Thanks Susan and Appy! Her crab cakes were wonderful, too - fresh and full of crab. She promised 95% crab meat and she delivered. She told me the only ingredients in her cakes were blue crab - always fresh, never frozen - scallions, some bread crumbs and egg. Respect. That is what Averill has for her food, the city, and culture. She was as gracious to her employees as to her customers: direct, honest, watchful, courteous. And that made for a wonderful dining experience, improbable as that may seem when perched on stools in a crowded market house. 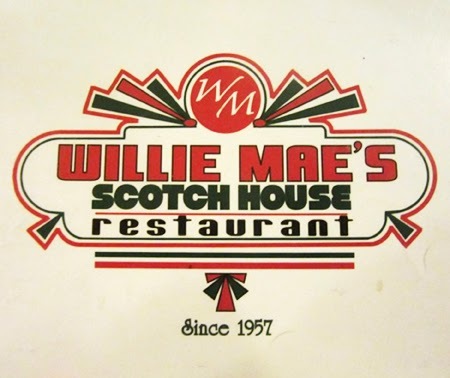 Additionally she told us of a few places not to be missed, one of which is Willie Mae's Scotch House. Best fried chicken ever!! If you go to Willie Mae’s, make sure you have the butter beans as your side. Heaven! 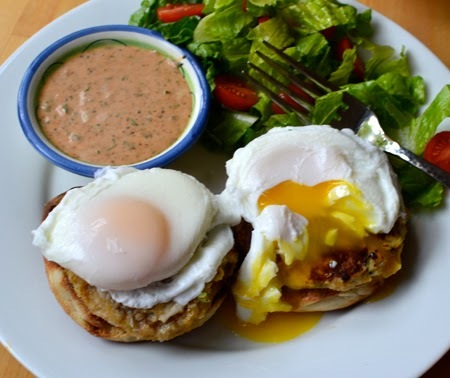 Today's recipe is for crab cakes - served just as Averill served them: on an English muffin (hers was whole wheat) and topped with a poached egg. Like hers, the rémoulade sauce is served on the side. And don’t forget an abundant and colorful salad! 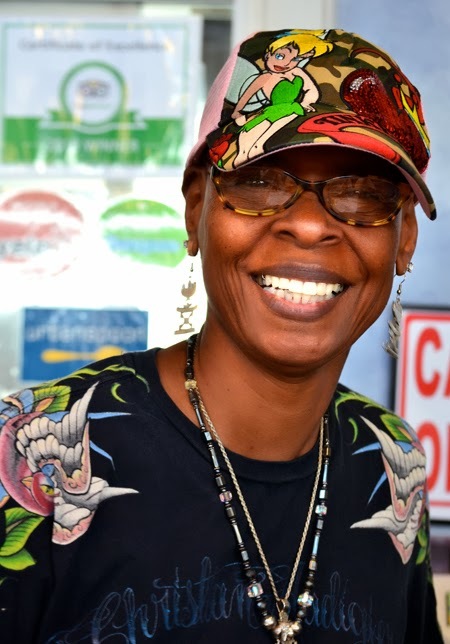 Next time you are in NOLA, make sure you get to the French Market and take a meal with Averill at Meals From the Heart. You will have no regrets. And let her know I sent you! 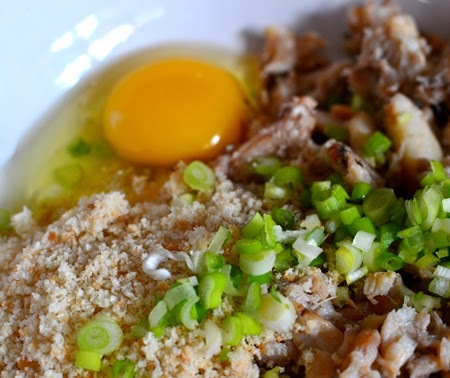 Mix the crabmeat, 1/2 cup bread crumbs, egg and chopped scallion together with a fork, being gentle so that you keep large chunks of crab. Place remaining bread crumbs on a plate. 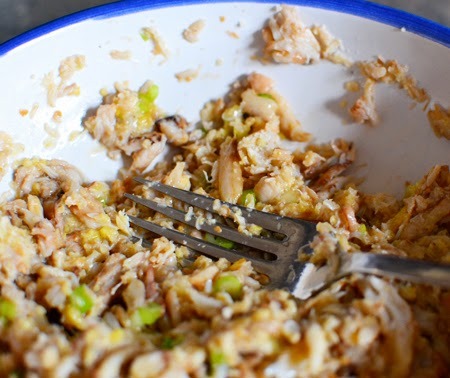 Divide crab mixture into four equal parts. Make four patties and dip both sides in the bread crumbs; firm the patties and place them on a plate. Place a well-seasoned cast iron skillet over medium-high heat (Note: Arizona State-shaped skillet otional... sadly, we didn't have the Louisiana-shaped skillet), add a teaspoons of olive oil, and fry crab cakes 3-5 minutes per side, until crispy and golden brown. Serve with remoulade sauce (recipe follows) or on an English muffins topped with a poached egg, with remoulade sauce on the side. Mix all ingredients together in a bowl. Keep refrigerated. Makes a heaping cup of rémoulade. The rémoulade sauce sounds like it would be very tasty. I must agree with you about the lack of fresh salads and vegetables in New Orleans. It's a real struggle to find them! And you've reminded me that I still haven't tried your recipe for Worcestershire sauce. Wasn't it amazing how hard it was to find a salad? We now know we can always go to see Averill. I hope you do the the Worcestershire sauce, John - it is pretty amazing. This would be so scrumptious or brunch. (Today!) ;-) What a great photograph of Averill. Another great travel/food story. You must write a book! Next time you are in NOLA, try Central Grocery for an authentic muffaletta. It is across the street from the market. And, as a native New Orleanian, I have to say I am DONE with eating in places where dirt and grease are supposed to count as "character" and there are no vegetables or salads in sight. Some of the newer chefs (like Donald Link at Cochon) are really trying to cook with fresh local ingredients, but the old guard, more traditional places usually don't include salads or vegetables, and when they do, they are canned or cooked to death! No can do after living 35 years in California! My one exception: Domilise's Po-Boy! Kirsten - Averill told us to hit Central Grocery for a mufaletta so we went that day (Sunday) - but they were closed. Next time, for sure! We loved Cochon on our first visit. So may good places that keep the traditions but now add veggies! Will also check out Domilise's for a po-boy next time. Yum! I second Kirsten's vote for Central Grocery. I have had many muffalettas there. In fact, on one of our visits to New Oreleans, I was pregnant but HAD to have a muffaletta...so ask me someday who has the nick name "muffie." Susan - I am laughing out loud. I think that if I ever called her Muffie, she might never speak to me again! Okay, I will go back and have one at Central Grocery as soon as possible! David, love the Arizona skillet!! Very cute :). It's always nice to meet people who do care and respect the food, it's the only way to enjoy good food. Unfortunately, lately too many are concerned with making money and not enough about the food they make. It's nice to know there are places like this. The crab cakes look wonderful! The whole plate looks divine, the oozing egg, the salad and the lovely crab cake! I hope you are well David! I am being lazy and enjoying not have to blog :) Chat soon. David, there is another ingredient that we do not find around here ...frist the grits, now the fresh crabmeat, well, you can order some but it will be rather pricey..not really meant for crab cakes...sad but true. 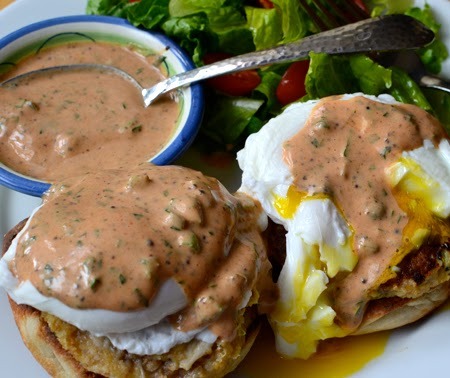 And your plate looks so wonderful with the poached eggs, the fresh crab cakes and the Louisiana Rémoulade - I will definitely have to give that sauce a try and serve it with fish - I am certain it will be a huge hit at our house! Lovely post, dear friend - hope you had a wonderful weekend (it was actually 17 degrees Celsius here today and I turned on the BBQ in mid-February!). Andrea - no crab?? That is horrible! I will have to make a version of shrimp cakes for you. Or salmon. 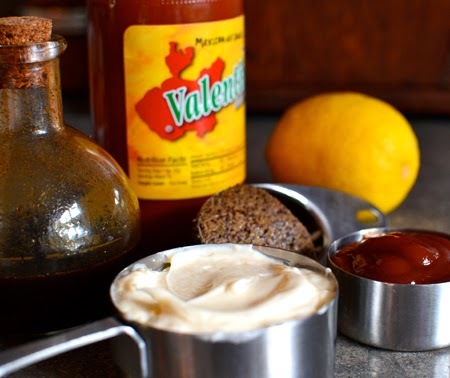 I love the rémoulade sauce - we use it for a lot of things. Glad you enjoyed the post. I am about to hit the garden to read blog posts and get caught up! It is 30°C today here! We are hoping for a cooling trend this week! 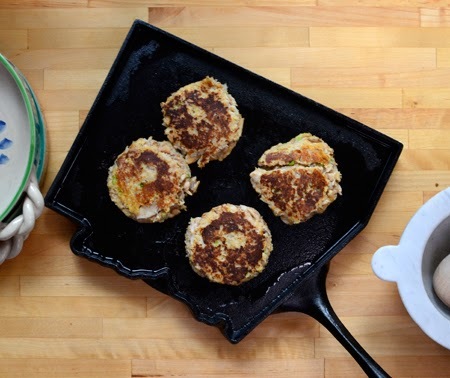 Ooooh eeeee… love the sound of these crab cakes! 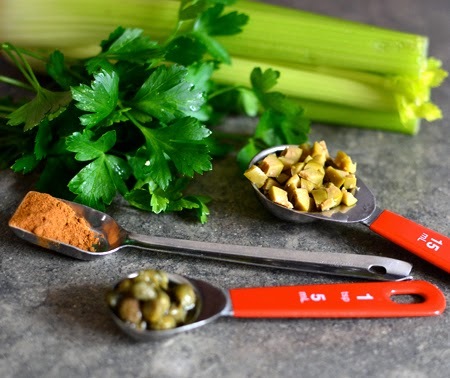 And such a great travel post along with the recipe. Thanks so much for sharing! Why, thanks Liz! Glad you enjoyed it! Okay I was going to say I'm going to move in with you. But then I realize I turn into a heifer. These cupcakes look amazing I love the remoulade sauce. Hi David! the crab cakes look tasty! :-) When I drove along the East Coast with a couple of friends ( from Baltimore), we could eat a hamburger with crab and shrimps only in Fernandina Beach, Florida! :-) We would have even travelled to New Orleans, but there wasn't enough time. Congrats for the post! Marco - there never seems to be enough time when traveling, eh? The crab on the east coast is amazing, and I am glad you got to try some! Looking forward to reading your posts on that visit! I don't think I've ever had crab cakes topped with a poached egg - I am intrigued! 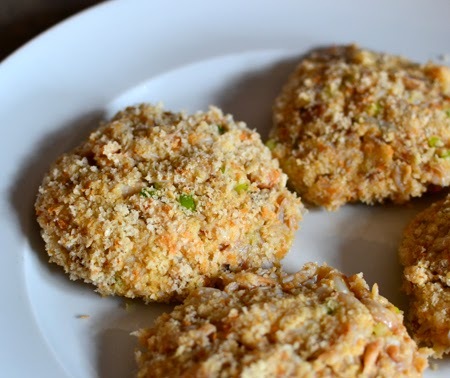 Love simple recipes like this crab cake one! Thanks, Shashi - I think you would like this combination! David, I'm wanting to get back to The Quarter sooner than later...and your blog just makes that journey jump up on the list! Your fab photos jump off the screen! These are my kind of crab cakes! Great post! Thanks, Susan! Glad you enjoyed it! Great phillosophy within the authentic dish!!! it was "comforting" food all about.. Thanks, Dedy - I will have to check out your site to see what crab cakes you have made! Yes, Karen, I think we did pretty well. Let's just say that no one starved! I liked the olives in the rémoulade sauce - they added great flavor sand texture! I am getting hungry just looking at these gorgeous pictures! Thanks, Cathleen! I was just on A Taste of Madness and felt exactly the same way! Oh my...this is yet another vivid reminder why I love New Orleans. I'm so hungry now! Thanks for another great post. Cheers from Canada! Thanks, Colleen! Just made étouffée last evening and, like you, was reminded why I love NOLA so much. Thanks for stopping by - love your blog! I love the fact that Averill is bucking the trend and serving healthier versions of NOLA favourites! Whole wheat and SALAD? Awesome. I can imagine how delicious that meal would've been. Thanks for sharing a similar crab cake recipe. I feel like an American food ignoramus but I've never actually eaten anything remotely New Orleans inspired. I will be trying this recipe on the weekend and serving up a breakfast just like this. Yum! Thanks, Laura - but I suggest you try the shrimp étouffée I posted a bit ago. That is real NOLA cooking at its best.